This chapter provides a brief summary of the project, keying on the importance of furthering the understanding of uber-sport’s politicization within the current conjuncture. 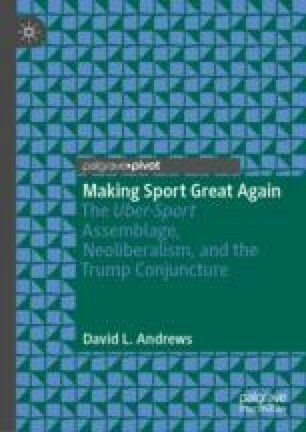 The general recognition of sport’s relationship with politics is noted, as is the conservative rueing of this politicization, specifically with regard to the mobilization of activist politics in the uber-sport arena. Despite their disavowal of politics, the American Right and Trumpism in particular have successfully articulated their ideological orientations and affective investments to the uber-sport assemblage. In light of this, the discussion challenges progressives to counter uber-sport’s regressive and reactionary politicization, by investing in the political-cultural work required to rearticulate uber-sport to emancipatory and actualizing political formations. This conjunctural analysis is offered as a modest contribution to such a project. Carrington, B. (2018, May 29). You can’t separate sports from politics because sports are politics. The Huffington Post. Retrieved from https://www.huffingtonpost.com/entry/opinion-carrington-trump-pardon-nfl-protests_us_5b0d8c35e4b0568a880f2057.